Mangore | Bellucci Guitars - Bryan Adams, "I Do It For You (Robin Hood)"
Bryan Adams, "I Do It For You (Robin Hood)"
This is one of the greatest soundtracks ever by one of my favorite composers: Bryan Adams. The song was written for the Hollywood blockbuster "Prince of Thieves" (Robin Hood) Starring Kevin Costner. This prolific Canadian composer is responsible for composing some of the greatest hits from the mid 80 to the late 90s. Bryan Adams is a rock guitarist and I knew that I'd find a path for a transcription for the classical guitar. Everything I do fits our instrument to perfection and you will have to always keep the main melody above the underlying arpeggio. Practice each staff slowly so as to figure out the correct plucking for each note. The proper use of the open strings will always allow you to have more leverage when it comes to moving around the fingerboard playing the different chord/arpeggio scenarios. 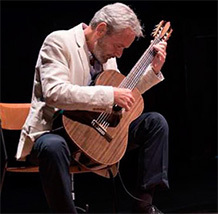 The classical guitar player must alway make full us of open strings because these will help overcome otherwise insurmountable technical obstacles. Use the open strings marked in colors in the video to move around the fingerboard with ease and achieve the changes in position more fluently. Open strings are always a "breath of fresh air" to the guitar player.